Step up the look of your event with a sleek podium / lectern, ideal for any presentation, seminar, conference or public speaking event. 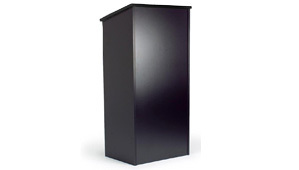 Our podiums feature a slightly slanted top to hold your notes & documents while keeping them out of view from the audience. We include a small LED light to illuminate your documents. 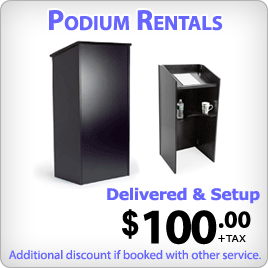 The podiums also have a bottom shelf which is great for cups of water, props or additional notes. A gooseneck with microphone clip can also be fastened to the podium if needed at no extra charge.